1. In a nut grinder, slowly grind the bag of crackers 5 at a time. Repeat until the half-bag measure is crushed. 2. Heat the sugar in a medium skillet over medium heat. Wait until sugar becomes a dark liquid and add the cracker pieces. BE CAREFUL NOT TO BURN THE SUGAR. 3. Stir quickly and remove from heat. Cool on greased, lined cookie sheet. 4. Once cool, break into pieces and run through nut grinder again to get finer pieces. 5. Pour contents of caramel sauce into a bowl. 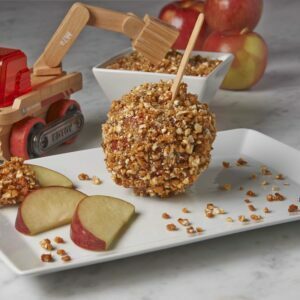 Skewer an apple with a wooden stick and submerge into the caramel sauce. Roll the covered apple in the caramelized crackers and let sit on lined cookie sheet. 6. Place in refrigerator to harden.